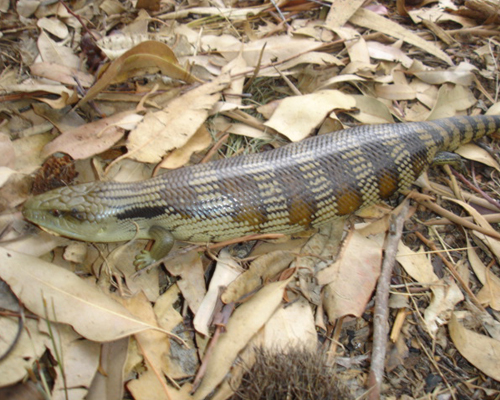 The Blue Tongue Lizard is often found in suburban backyards and bush land. Quite often people are under the impression that if you have a Blue Tongue in your garden then you won’t get a snake, if only it was that easy, but unfortunately this is nothing but a myth. Adult snakes eat blue tongue lizards. The lizard is known as a Blue Tongue because it’s tongue can range from bright to dark blue, and will hiss loudly when disturbed. It is a stout and slow moving lizard that grows up to around 50 cm in length, brown to grey scales and a barred pattern across the body and tail.The belly is cream or yellowish-white. Blue tongues play a valuable role in your garden by controlling pests such as snails, slugs and spiders. They also eat berries, vegetation, flowers and insects. Their main predators are dogs, cats, snakes and even cars. As spring arrives the lizards tend to warm up their bodies on the roads, which unfortunately leads to an untimely death.